We serve Jackson, Nashville, Clarksville, Bowling Green, Murfreesboro, Owensboro, Utica, Fayetteville, Marion, Philpot, Franklin, Leitchfield, Paducah, Mcminnville, Hartford, Antioch, Shelbyville and many nearby areas in Tennessee and Kentucky. At Frontier Basement Systems, we recommend installing the SmartJack™ System, which uses adjustable heavy duty steel crawl space jack posts. These posts install quickly in a home and provide the best solution for restoring stability to your structure. The SmartJack™ system can be installed in tight conditions, usually in less than a day. Made with galvanized steel for corrosion resistance, it can support vertical loads exceeding 60,000lbs. The SmartJack™ is the only solution that addresses problem soils during crawl space restabilization! At the beginning of the installation, our team of in-house crawl space repair contractors will excavate a 2' square, 2' deep hole at each SmartJack™ location. Each of these holes will be prepared with engineered fill consisting of tightly compacted crushed stone. Once the SmartJack™ has been installed in your home, you can rest assured that you've invested in a high-quality, permanent solution for your crawl space issue. Each SmartJack™ is then tightened in an attempt to lift the floor back to its original position. In many cases, your contractors will be able to straighten and level floors, close cracks in walls, and halt future downward movement. The jacks will continue to be adjustable for future tightening, should you need it. If you'd like a permanent solution for your crawl space issues or any other foundation problem, we're ready to help you. We offer free crawl space structural repair quotes to homeowners in the Tennessee and Kentucky area. To schedule your free, on-site visit and written estimate, call or e-mail us today! 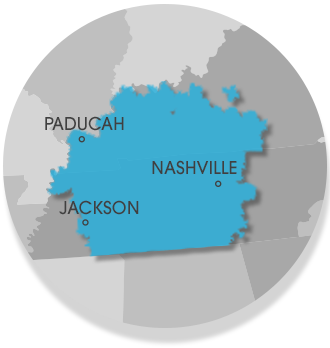 Our service area includes Clarksville, Nashville, Jackson, and nearby areas such as Murfreesboro, Owensboro, Philpot, Bowling Green, Fayetteville, Marion, Utica.